Philip Rosenthal, the longtime director of the world-renowned design firm Rosenthal AG and then-president of the German Design Council, offered the following comment in a 1978 interview about the cultural importance of West German industrial design: "If we consider what Bauhaus achievements and Braun design policies have done to offset the image abroad of the 'despised German' bent on war and economic power with that of the 'good German,' then we should enlist more monies and manpower to help continue this cultural foreign policy, especially since everyone already knows Goethe and Mozart." At first glance, such an opinion may seem nothing more than unmeasured enthusiasm from a well-known entrepreneur and design publicist interested in pitching his country's wares. Never mind that Mozart was Austrian, nor need one linger over what Rosenthal meant by "everyone already knows" these great luminaries past. What is so striking about the passage is his casual assumption about the elective affinity of industrial design and the rehabilitation of the "good German." Rosenthal's remark prompts several questions: What exactly did industrial design have to do with West Germany's "cultural foreign policy"? What was so special about the modernist idioms of Bauhaus and Braun that they acquired such transformative cultural power? Or, more broadly, what were the imagined connections among commodity styling, cultural progress, and national identity? This book is an attempt to tackle these questions. It seeks to uncover how and why industrial design emerged as a primary site for fronting a new West German cultural order. Rosenthal was by no means alone in his conviction about the political windfall of design. Similar views were shared by many of his generation, particularly among those West Germans involved in the business of building a shiny new industrial culture atop the charred remains of the past. To the extent that modern design was seen as practically synonymous with starting afresh, this project went far beyond simply converting design into lucrative export revenues. Indeed, the postwar period gave rise to a unique West German "design culture" comprising a vast network of diverse interests, including the state and industry, architects and designers, consumer groups and museums, and educators and women's organizations. What united them all was the identification of design as a vital means of domestic recovery, cultural reform, and even moral regeneration. The soaring idealism surrounding design mainly derived from its "everydayness" and thus its ability to affect the daily lives of all West Germans. Poised at the crossroads of commerce and culture, of industry and aesthetics, as well as of production and consumption, industrial design played host to a panoply of dreams about what a new and progressive West German material culture might look like. To be clear, this study hardly pretends to cover all of the industrial design of the period. It does not deal directly with urban planning, residential architecture, or vehicle design; nor does it take on postwar arts and crafts, clothing, advertising, or graphic design. It focuses instead on everyday household objects—lamps, china, glassware, consumer electronics, and furniture. 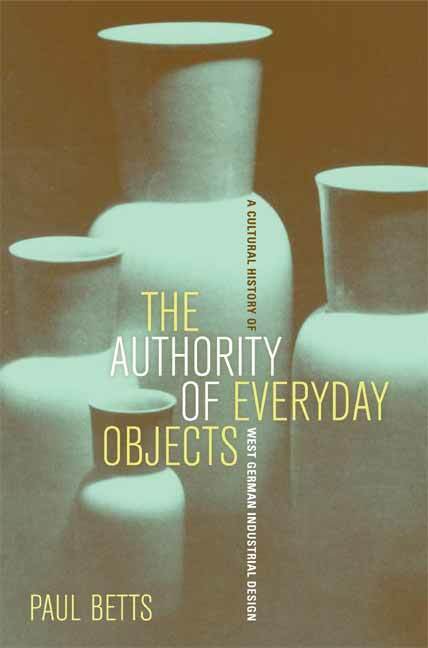 But unlike other design studies, this book is no detailed monograph on any one of these object groups. Of uppermost concern here is why these commonplace wares assumed such heightened cultural significance in the 1950s. For many observers, it almost goes without saying that West Germany is linked with high-quality design goods—be they automobiles, audiovisual equipment, lighting, glassware, furniture, or kitchen appliances. But relatively little attention has been paid to the role of these goods in general cultural history. After all, West German culture is usually associated with the revival of literature, painting, film, architecture, music, and theater after the war. Even the most cursory glance through the vast historiography on post-1945 German culture indicates the extent to which design—not unlike kindred second-class subdisciplines such as fashion, television, pop music, and advertising—has been routinely ignored. Only recently have scholars begun to acknowledge that if the 1950s and 1960s marked the genuine emergence of broadly based consumer cultures, then the history of the so-called low arts as both cause and effect of this wider phenomenon may afford fresh perspectives on postwar life and society. Over the years various design historians and cultural critics have taken pains to fold the study of postwar design into German cultural history more generally. But design has yet to be fully accepted into mainstream scholarship, not least because it is still seen as a splashy academic newcomer whose achievements are better placed on the coffee table than the scholarly bookshelf. This is all the more unfortunate given design's particular authority after 1945. At a time when the more traditional cultural branches of (West) German culture—with the arguable exception of fiction—were struggling unsuccessfully to regain their interwar international audiences, design helped the new republic establish a lasting reputation as a vibrant center of industrial modernism. At issue, however, is more than just charting a postwar renaissance in industrial design. For its rebirth went hand in hand with another vital—if often overlooked—element of West German culture, namely a new relationship between people and things. The look, allure, and pursuit of high design goods, while certainly notable in earlier decades, took on previously unknown proportions in the 1950s. It was at this time that design effectively unseated architecture—the most contested and ideologically laden of cultural fields during the Weimar Republic and the Third Reich—as the era's prime sphere of mythmaking, identity formation, and cultural anxiety. Not that this shift was somehow less political. Governments across the Cold War divide owed much of their legitimacy to the promise of delivering material prosperity to war-ravaged populations nursed on wartime propaganda about the good life that would follow the cease-fire. With time it even became a key issue of international politics. Design was thus invested with unprecedented political power during the Cold War, if for no other reason than that it was often used—along with consumerism itself—to measure the differences between East and West. The famous "kitchen debate" between Soviet Premier Nikita Khrushchev and U.S. Vice President Richard Nixon in the American pavilion at the 1959 Moscow Fair, where they sparred over the ideological meaning of hi-tech American kitchens and consumer appliances, signaled a watershed moment in the Cold War politicization of material culture. But modern design carried special symbolic weight in West Germany. On one level, this had to do with the harrowing wartime destruction of people, places, and things, followed by the rough struggle for survival amid the "hunger years" of the war's aftermath. Little wonder that having a warm, safe place of one's own became the most powerful desire for many Germans through the 1940s and 1950s. There has been much written on this theme, especially concerning the pivotal place in West German collective memory of the 1948 currency reform as the real psychological close of the Second World War and in turn the unleashing of new dreams of recovery and affluence. Yet it was not merely the indiscriminate acquisition of things that mattered; so too did their appearance. As the cultural historian Klaus-Jürgen Sembach recently noted, the presence of modern design objects helped both to offset the material losses of the war and to presage the coming of a brighter world. Such things signaled the break from Nazism's war economy and rationing imperatives, all the while showing that the spell of Nazism's cramped "blood and soil" culture was finally broken. Modern design objects had thus become emissaries of change and redemption, what Sembach calls "tangible and visible expressions of Wiedergutmachung [making good again] to all of the world." It was in this spirit that modern design goods were publicized and exhibited in the high-profile international fairs of the '50s, such as the Milan Triennale and most notably the West German Pavilion at the 1958 World Exposition in Brussels. Even if Sembach overlooked many of design's continuities with the past, he has a point in arguing that the '50s was perhaps the most "thingly" of all epochs. For the idols of the marketplace now replaced the political idols of the preceding generation. That the economic takeoff did not really make a significant difference for most West Germans until the tail end of the decade in no way deterred—and may even have intensified—private consumer passions. But it is not enough to say that design's cultural elevation was merely the by-product of the "end of ideology," repressed memories, and the frenzied pursuit of material happiness. The styling of these everyday objects effectively became Adenauer Germany's insignia of recovery and restored sense of achievement. In largely concentrating on the first two decades after the Second World War, this study takes its place among the ever-expanding literature on West Germany's nervous negotiation of past and present during those heady years. The '50s have attracted such widespread academic interest of late in large part because of the decade's dual role as both a dramatic endpoint and a new beginning. On the one hand, it brought to a close the harrowing spell of military adventurism, economic chaos, political extremism, and wanton mass destruction that had disfigured German history and experience since 1914. On the other, the 1950s marked the first successful implantation of liberal democracy in German soil and saw the country's full transformation from a warfare to welfare state. In this double sense, the decade broke from the fateful "German catastrophe" of the preceding two generations, paving the way for this fledgling post-Nazi state and society to be fully reintegrated into the charmed circle of "civilized nations." Even the slew of 1960s leftist critiques attacking the Adenauer era's scandalous continuities with the fascist past never quite managed to topple the decade from its cultural pedestal. With time the image of the '50s as the "Adenauer Restoration" was supplanted by one emphasizing its radical modernization. By the 1980s the "Golden '50s" had gained almost mythic status, not least because the period was seen to have furnished the once-uncertain Bonn Republic with a solid foundation of constitutional liberalism, cultural pluralism, a model modern welfare state, and a standard of living unparalleled elsewhere on the Continent. Perhaps the most telling testimony of West Germany's warm affection for the "fab '50s" was the remarkable outpouring of pop culture nostalgia for the decade during the late 1970s and early 1980s, when aging baby boomers of all political stripes summoned rather sentimental memories of what one popular retrospective at the time dubbed the "puberty of the republic." Since 1989 the focus on the '50s has only intensified. No great surprise there, especially given that Reunification inevitably brought questions about the historical origins of German Cold War identities and differences. In recent years scholars have deftly peeled back the accumulated layers of dusty political propaganda and Cold War cliches to explore the cultural conditions of both rival republics, with a sharp eye toward how the '50s served as a unique crucible for forging new beliefs, values, and allegiances. Old pieties about the respective "sovietization" and/or "Americanization" of Germany have given way to more nuanced pictures of the interplay of superpower imperatives and national heritage, official histories and personal identities. Of perhaps greater relevance here is that the events of 1989 have also prompted serious reconsideration of consumerism as a potent political force. In the East German case, consumer desire frequently has been identified as a major political impetus behind the sudden collapse of the German Democratic Republic (GDR), as the Socialist Unity Party's continual promises of worker prosperity eventually provoked a rallying cry of opposition denouncing the state's political malfeasance, hypocrisy, and illegitimacy. Consumerism exerted an equally powerful—if inverse—effect upon West Germany. As noted above, pioneering oral histories conducted in the 1970s and 1980s not only revealed the extent to which the revival of consumerism—as opposed to the 1945 cease-fire or the 1949 achievement of statehood—really represented the end of the war for many West Germans; they also showed how postwar well-being and happiness were increasingly expressed in material terms. More recent research has thrown new light on the subject, illustrating the ways in which '50s consumer culture and practices were subjects of highly charged political and moral debate. Pastimes such as entertainment film, food, family, sexuality, tourism, youth culture, and purchasing itself have been rescued from their old second-class status as superstructural chaff, and now occupy the very center of historical inquiry into West German modernity. Some observers have even made a good case that material affluence and consumer pleasure were the main stabilizing forces behind West German liberalism. So whereas consumerism played its part in undermining the East German regime, it was instrumental in holding West German state and society together. With the end of the Cold War came new perspectives on the past. Cultural historians have been particularly active in this regard, painstakingly showing how the legacy of German modernism was subtly negotiated and even resisted in both republics. That material culture would become a rich new vein of historical inquiry was quite predictable, given the importance that had been attached to it on both sides of the Wall. Equally influential have been broader trends in international research in the last fifteen years or so. Considerable effort has been made to establish design history as an independent discipline at the crossroads of social history, cultural studies, and popular culture. The so-called visual turn in transatlantic academic culture has meant that more and more scholars are exploring the interface between material culture and more traditional disciplines. While innovative art historians, sociologists, and anthropologists initially led the way in the study of everyday objects, cultural historians have increasingly trained their attention on the surface appearances of everyday stuff. This has been especially the case in German history of late, as consumerism and material culture have emerged as what Alon Confino and Rudy Koshar call "new narratives in twentieth-century German history." Nonetheless, one must be careful about confounding design with consumerism. While no one would deny that the two are often closely related, they were and are sometimes at odds with one another. This is particularly true during moments of economic crisis. Take, for example, the Great Depression. The collapse of Western "consumer regimes" hardly spelled the decline of design in Europe and the United States—quite the opposite. The '30s marked a heyday of modern industrial design on both continents, prompting several cultural historians to christen the otherwise forlorn '30s as the unsung Golden Age of modern design. It was the real Gründerzeit of design, when a legion of leading designers emerged as new social engineers intent on making over the shapes and surfaces of transatlantic material life. Doubtless this was most pronounced in the United States, but "Depression Modern" could be found throughout Western and Central Europe too. In this case, stylization was a direct product of economic downturn; not for nothing was flashy '30s design widely derided as "chromed misery." Much of this product "face-lifting" was obviously geared toward stimulating flagging consumption after the Crash. But in the process, designers also invented an abiding aesthetics of speed and progress, whose fetching futurist images of sleek, streamlined civilization played no small role in auguring a shimmering world beyond the travails of the present. Designer dreamworlds became even more important during the Second World War. Over the course of the conflict, design was increasingly pressed into political propaganda, as modern consumer goods were often dangled before war-weary populations as promissory notes of the good life to come once the war was over. This was plainly the case among the Western Allies, but it found expression in Nazi Germany as well. The highly touted Volkswagen and Autobahn projects were only the most famous, as we shall see in chapter 1. Given the regime's awareness that consumer privation had led to mutiny and revolution at the end of the First World War, the Third Reich untiringly manufactured images of postwar consumer splendor in order to quell domestic discontent and better bind citizen and state. After 1945 the link between high design and economic hardship was equally manifest in the GDR, where modern design aesthetics were frequently mined as symbols of socialist modernity and future prosperity for all workers. Yet it was just as conspicuous in the Federal Republic during the '50s, when modern design was frequently broadcast as cultural proof of both rupture and renewal. That many of these goods were clearly beyond the reach of most West Germans (a Braun phonograph cost DM 600 in 1955!) in no way detracted from their cultural value as new ciphers of hope, longing, and normality. Idealism and materialism were thus inseparably bound within the design object itself. All of which is to say that style mattered. If nothing else, the history of '50s design underlines the point that postwar consumerism cannot be reduced to a facile "more is better" story. As Michael Wildt has shown in his study of everyday eating habits and consumer proclivities among a range of Hamburg residents after the war, consumerism was never indiscriminate. West Germany's design culture too was very picky about what constituted "good design." The ideal was a rational, "enlightened" functionalist design style to best complement (and even help create) rational, "enlightened" postwar citizens. Standing behind this philosophy was clearly the old universalist dream that had animated modern German design since the late nineteenth century. Nonetheless, "neofunctionalism" also derived its moral authority from the specific postwar situation. In a country devastated by war and the crushing shortage of necessary goods and materials, the call for simple, practical, and long-lasting design was hailed as the very expression of a new postwar moral economy, one that did not squander precious resources or bow to black market pressures to pass off shoddily designed goods. Little surprise that the prewar Werkbund-Bauhaus language of "morality of form" and "honesty of materials" was retrieved as the ideological underpinning of this '50s design crusade. Yet it would be wrong to dismiss such neofunctionalism as merely Bauhaus redux, since the radical interwar campaign to reduce the object to strictly functional attributes enjoyed little resonance in the '50s. Instead, the '50s world culture of high design was very keen on uniting design practice and humanist culture. The design ware was redefined as a distinctive "cultural good" (Kulturgut) possessing certain ethical qualities and even a spiritual essence. This was the concept behind the much-touted "good form," inasmuch as it represented a nominal marriage of ethics and aesthetics. Not that these designers and publicists were at all unanimous about what "good form" was and should look like; the reestablished German Werkbund, the German Design Council, and the Ulm Institute of Design, for instance, were often bitterly divided on this issue. Nor did they agree on what counted as the proper "mediation of the design ware." Strategies ranged from calls for more state control to demands for copyright law reform to stricter professionalization standards to alternative exhibition display, as well as novel pedagogic initiatives. Underlying them all, however, was a common conviction that the design object must not be left to the whims of the marketplace and that intervention was needed. So amid the frenzied materialism of the "Fresswelle [food binge] '50s," there was a discernible streak of antiliberalism shared among the brokers of West Germany's new material culture. The singular importance of industrial design in West German culture can largely be attributed to four factors. Foremost among them was economics. Once the 1948 currency reform had taken effect, it was clear that West German economic recovery now depended on generating export revenues as quickly as possible. For many observers, the early 1950s windfall resulting from increased demand abroad for Bosch refrigerators and Braun mixers was an indication that much of the country's immediate economic future lay in the industrial production of consumer goods. The most ardent advocate of this view was no other than the Federal Republic's legendary minister of economics, Ludwig Erhard. While it is well known that his "social market economy" was based on the trinity of consumer satisfaction, social welfare, and political stability, it is often forgotten that industrial design occupied a central position in his economic philosophy. In one 1952 speech delivered before the powerful Federation of German Industry (Bundesverband der deutschen Industrie, or BDI), for example, Erhard insisted that new industrial design was instrumental in winning back the country's former preeminence in the field from foreigners who "have further cultivated our former successes." Only by producing "beautifully designed manufactured equipment" could West Germany overcome this "design gap" and in turn strengthen its fledgling economy. The explosion in the production of West German plastics and consumer electronics in the wake of the Korean War further underlined the growing importance of design within the rapidly expanding capital goods sector. Numerous industrial organizations and design venues were founded during the 1950s to help secure the place of industrial design within West Germany's burgeoning economy. The perceived significance of design was perhaps best illustrated by the 1951 creation of the German Design Council as a new government agency inside Bonn's Ministry of Economics, for the express purpose of popularizing West German industrial design both at home and abroad. Secondly, the primacy of design was also related to postwar cultural idealism. Like other postwar reformers, this new design culture was inspired by the idea of transforming the wreckage of the past into a brave new world of postfascist modernity. In the immediate postwar years, the revived German Werkbund—whose regional branches were equally active in Düsseldorf and Dresden, in East and West Berlin—emerged as a forceful player in this broad reform movement. Originally founded in 1907 as a pioneering association of artists and industrialists dedicated to engineering economic and cultural reform through the modernization of German architecture and design, the Werkbund was one of the most successful German cultural organs in leading the crusade for industrial modernism through the 1920s and early 1930s. Even if many of its leading lights emigrated after 1933, those remaining Werkbund members in Germany in 1945 were convinced that their long campaign to introduce mass-produced, high-quality, and affordable housing and everyday wares was more pressing than ever. In their eyes, the seemingly limitless physical devastation and moral collapse of the nation occasioned a momentous historic opportunity to fulfill their old dream of design as radical reform. For them, genuine denazification could never result from abstract liberalism or administered "reeducation," but must first begin with the very forms of everyday objects and environments. While it is true that the imagined linkage between the reconstruction of social forms and the cultural "reeducation" of its users was a long-standing theme of German modernism dating back to the Wilhelmine period, the Nazi legacy of mass death and destruction lent it both moral urgency and historic possibility. Such sentiment took on additional gravity because design was one of the few German cultural spheres that remained practically free of superpower control. Here again industrial design was unique. As opposed to most West German cultural branches—above all painting, cinema, education, and pop music—which were subject to heavy American influence, West German designers patently rejected American streamline styling. True, a few American design figures like Charles Eames and Florence Knoll garnered consistent praise. But this in no way curbed the outpouring of West German polemics that judged the more general American philosophy of streamlining products in the name of streamlining sales curves to be both dishonest and irresponsible. Typically they viewed America's "Detroit Baroque" as essentially a child of the Depression, where business recruited designers to help reinvigorate consumerism after the 1929 Crash. Condemned as wasteful, deceitful, and even overly militaristic, American streamline design was subjected to the same animus once reserved for nineteenth-century European historicism. The 1952 German translation of the French-born American streamliner Raymond Loewy's 1950 autobiography Never Leave Well Enough Alone became a favorite reference for pointing out the corrosive cultural effects of American Civilization. So in contrast to other cultural fields, this species of American modernism was neither admired nor emulated as a beacon of progress and modernity. The very vocabulary used to define West German design was instructive. Invariably West Germany's design culture retained the more traditional German concept of Formgebung (form-giving) as a defense against the putative Anglo-American conflation of design with cosmetic styling. Moreover, the fact that the Nazis had openly exploited this 1930s American streamline aesthetic for their own "futurist" political propaganda also helped establish needed cultural distance from both Nazi past and American present. Demonizing the aesthetics of Nazi militarism and American commercialism thus enabled West German designers to clear some political space in which to reclaim their own pre-1933 modernist traditions. But no matter how much industrial design was used to convey new images of antifascist culture and post-Nazi progress, there were undeniable connections with the past. In the main, these had to do with the former marriage of Nazism and modernism. That Italian fascism had exploited avant-garde culture for its own purposes has long been common knowledge; less well known is that the Nazis enthusiastically embraced industrial modernism as well. Alongside the widely circulated images of Speer-esque monumentalism, Teutonic kitsch, and pastoral romanticism flourished a widespread Nazi fascination with automobiles, airplanes, and mass media. Not to suggest that the Third Reich's infamous "blood and soil" ideology was somehow unreal or powerless; much of German culture was violently purged of "cultural bolshevism" by the regime. Yet such reactionary Nazi cultural policy was largely confined to the fields of painting, statuary, crafts, and representative architecture. Industrial design was never "coordinated" in the same way and even enjoyed surprising independence throughout the Nazi years. This inevitably raises a number of thorny questions about influence and continuity. Ironically, those design objects singled out and advertised after 1945 as symbols of "cultural denazification" were not infrequently the same ones that had been showcased in Nazi design exhibitions just a few years before. To argue that 1950s design was nothing but a shameless restoration of Nazi Modern widely misses the mark, however. The crucial point is that the Third Reich contributed precious little in terms of design innovation, devoting its energies instead to reflagging classic Weimar modernism for its own purposes. On the whole, in fact, German industrial design did not change very much from 1925 to 1965; and this goes for both West and East Germany. What did change, of course—and this is the underlying theme of this book—was the cultural meaning and representation of design, as the very same objects were embraced by dramatically incongruous political regimes as visual markers of their specific political projects. Of central concern to the West German design culture was then how to cleanse these modernist goods of fascist contamination. The first step was to purge all Nazi toxic rhetoric about design as "racial genius," much as the Nazis themselves had expunged the socialist language suffusing Weimar design a generation earlier. But this was not enough. A new positive language of modern design needed to be invented, not least because most of the exemplary design objects (at least until the mid-1950s) were essentially the same. This was why West Germany's design culture insisted on grounding design in humanist morality, since this was certainly one ideology that the Nazis disdainfully trampled underfoot. In response, West German designers and publicists strove to build a new industrial culture upon the moralization of material, that is, "good form." The third factor contributing to the importance of industrial design was its value as diplomatic capital. Using design to broadcast affirmative national images was by no means a postwar innovation. The tradition of linking design with the state went back at least as far the London Crystal Palace Exposition of 1851. Yet the West German rehabilitation was inscribed with special political gravity. Much of this had to do with the difficulty of framing a palatable West German identity after the war. The campaign to resuscitate antifascist German culture after 1945 was continually bedeviled by the fact that virtually all German cultural spheres, whether architecture, painting, film, music, philosophy, literature, or history-writing, had been badly contaminated by fascist association. Worse, what little antifascist culture did exist was itself often confounded by its explicit linkage to communism. The postwar rehabilitation of Goethe and Schiller, as well as exiled figures such as Thomas Mann and members of the Frankfurt School, indirectly confirmed that West Germany had few cultural heroes or traditions that satisfied the Cold War criteria of antifascism, anticommunism, and international modernism. From this perspective, the Bauhaus provided timely political service. Indeed, the Bauhaus story greatly assisted the wider West German effort to rewrite Weimar Modernism as the Federal Republic's true cultural heritage. Its postwar rehabilitation thus had as much to do with its victimization by the Nazis as its 1920s reputation as a mecca of avant-garde culture. That the Bauhaus was constantly attacked by the Nazi press as the supreme symptom of "cultural degeneration," was dramatically closed a few weeks after Hitler seized power, and was then savagely ridiculed in the infamous 1937 Degenerate Art exposition in Munich did much to assure its post-1945 standing as a symbol of "peace, progress, antifascism, and democracy" across the occupational zones. By the mid-1950s, however, the Bauhaus legacy became increasingly associated with the Federal Republic. The GDR's official condemnation of Bauhaus Modernism in 1950 as sinister bourgeois formalism and American cultural imperialism made it all the easier for West Germany to claim the Bauhaus mantle as its own. Leftist elements of Bauhaus history—to say nothing of its strange afterlife in the cultural politics of the Third Reich—were effectively whitewashed in the West German reworking of the Bauhaus as a polestar of International Style liberalism. The high culture celebration of Bauhaus master painters Paul Klee and Wassily Kandinsky, the institutionalization of Bauhaus pedagogy at postwar art and design schools, and above all its popularization in middle-class life (e.g., domestic interiors, furniture styling, and graphic design) registered the Bauhaus's accrued Cold War significance in helping give form to a post-Nazi West German culture. And even if the International Style most definitely did not dominate West German architecture in the 1950s and 1960s, it played a key role in the Federal Republic's more representative buildings such as the Bonn Bundeshaus, the West German Embassy in Washington, D.C., and the famed Berlin interbau showcase project. Not that the Bauhaus legacy was fixed and uniform. Take for example the brash '50s organic design style generally known as Nierentisch culture. Named after the small three-legged, kidney-shaped side table that served as its central icon, Nierentisch design was an alternative department-store design style that flourished outside the design schools and official exhibitions. It patently rejected functionalist asceticism by openly celebrating dynamic forms, bright colors, and wild asymmetrical shapes. In so doing it set out to recover a different Bauhaus heritage. In contrast to the more austere functionalist dimension of Bauhaus modernism championed by the German Werkbund, the Ulm Institute of Design, and the German Design Council, this other '50s design culture saw the lively individual spirit and painterly innovations of Klee and Kandinsky as the Bauhaus's true patrimony. As will be discussed in chapter 3, the tug-of-war between these two postwar avant-gardes underlined the Bauhaus's cultural authority in the creation of a postwar progressive culture. Perhaps the most decisive element in the Cold War remake of the Bauhaus legacy was its remarkably successful transplantation in the United States. The migration of the Bauhaus's leading figures—Walter Gropius, Mies van der Rohe, Josef and Anni Albers, Marcel Breuer, and Herbert Bayer, to name only the most famous—provided a distinct twist to the saga. For it afforded the added advantage of bridging a German modernist past with a modernist American present. Nowhere was its blue-chip Cold War stock more visible than in the 1955 founding of the Ulm Institute of Design as the "New Bauhaus." Initially inspired by Inge Scholl, who wanted to found a new school of democratic education in honor of her two siblings, both of whom had been killed as members of the "White Rose" antifascist resistance group, the Ulm design school dramatized the perceived connections among antifascism, modern design, and social reform. That the American High Command of Germany and the West German government jointly underwrote the Ulm project indicated the extent to which rebaptizing the Bauhaus served as indispensable Cold War diplomacy. The inauguration ceremony itself functioned as a spectacle of a reformed West Germany, as such notables as Henry van de Velde, Albert Einstein, Carl Zuckmayer, Theodor Heuss, and even Ludwig Erhard all lent their public support. Journalists on hand roundly applauded what one observer called "the Bauhaus idea come home" as a boon for an enlightened West German culture. Given West Germany's campaign to distance itself from its fascist past and to establish closer cultural relations with the United States, the Ulm Institute's privileged pedigree of both anti-Nazi resistance and Bauhaus modernism provided timely testimony to this cause. One West German cultural historian ironically described the school as a sort of "coming to terms with the past with American assistance." In this way, the Bauhaus legacy helped draw the Weimar Republic and the Federal Republic within the same elective liberal lineage, while at the same time forging a new transatlantic cultural partnership with America. Fourthly, the elevated cultural value attributed to postwar design was equally linked to the larger cultural effects of fascism. In some measure this had to do with the curious fact that it was precisely those ex-fascist countries—West Germany, East Germany, and Italy, as well as Japan—that rose after 1945 as the undisputed world leaders in industrial design. While design heritage and export pressures partly explain this phenomenon, an integral dimension resides in the peculiar cultural legacy of fascism itself. To better understand this, it pays to recall Walter Benjamin's famous characterization of fascism as the "aestheticization of politics." By this he was referring to well-known fascist techniques such as mass political rallies, monumentalist architecture, propaganda films, and the cult of leadership. According to Benjamin, the fascists had specifically deployed these in an attempt to intensify the identification of the people with the government and to dissolve all political resistance, cultural distance, and—in the German case—racial difference in an aesthetic spectacle of unified purpose and nationalist mission. What is particularly useful about his analysis is that it deftly sidesteps the tedious secondary discussion about isolating any supposedly "fascist style" in order to address the larger issue at hand, namely the explosion of aesthetics under the fascists. While no one would deny that urban mass cultures had substantially reordered European everyday life after the First World War, the crucial difference rested in the fascist fusion of state and aesthetics. It was evident in Hitler's and—to a lesser extent—Mussolini's coordination of culture, the media, and the arts in the name of new nationalist ideologies; it was also manifest in the fascist obsession with rendering politics visible and spectacular. Countless historical pageants, Volk festivals, military parades, propaganda films, art exhibitions, death cults, and grandiose buildings exemplified the fascist desire to invent mythic imperial pasts and futures, all the while mobilizing the passions of the present for imminent war-making. The Nazis were even more extreme in this visualization of politics, denouncing all loyalty to liberal political texts (among them the Versailles Treaty and the Weimar Constitution) in favor of decisive political action based on fatal aesthetic criteria—beautiful versus ugly, healthy versus degenerate, German versus Jew. Leaving aside specific fascist motivations and policies, the point is that it was precisely the visual mediation of all politics that forever earmarked fascist culture. It was thus no coincidence that this particular fascist legacy was strictly prohibited after 1945. In West Germany and Italy, for example, antifascist culture in large measure began with divorcing state and aesthetics. But this went far beyond the endgame frenzy to tear down the visual trappings of fascism at the conclusion of the war. The termination of the fascist era's massive production of nationalist kitsch and "cult of leadership" memorabilia, the rejection of monumentalist architecture, the demilitarization of industrial design, and the demystified cultural representation of postfascist political statesmanship all testified to the radical break from fascist political aesthetics. What is more, both West Germany's and Italy's disinclination toward converting city squares and streets into venues for political demonstrations, together with the fact that their most important state ceremonies—and this is particularly true of West Germany—generally took place indoors before relatively small audiences (to say nothing of the way in which these leaders were photographed) also signaled a studied departure from the fascist ritualization of social space. The Federal Republic's constitutional campaign to decentralize the state, education, and culture was part and parcel of this postfascist sensibility. The virtual postwar disappearance of large-scale urban spaces, the workspace, and the "laboring community" as sites of aesthetic idealism were also integral elements of this dramatic cultural denazification of public life. So whatever one might say about the scandalous cultural continuities between the 1940s and 1950s, it was quite clear that the fascist campaign to aestheticize the relationship between people (really, ruler and ruled) was effectively destroyed by the liberalization of West Germany. But even if this specific fascist cultural constellation was dismantled after 1945, "social aesthetics" did not vanish. They simply took on a new form. The implosion of the central state, the denationalization of Kultur, and the collapse of former affective languages of social solidarity (nationalism, socialism, and of course National Socialism), along with the emergence of the market as the principal sphere of postwar identity formation, were more than just denazification measures. What had happened was that the fascist campaign to aestheticize the relations between people had now given way to a postfascist impulse to aestheticize the relation between people and things. In other words, the postwar focus of aesthetics had moved from the public and spectacular (political rallies and grandiose architecture) to the mundane and private (domestic interiors and consumer appliances), from the glorification of the united Volk to the cultivation of consumer difference and individual lifestyle. It was in this setting that industrial design proved decisive, by brokering a distinctive postfascist aestheticization of everyday life. It was no accident that the home and the restored nuclear family served as West Germany's new romanticized sphere of post-Nazi moral and aesthetic idealism. To be sure, the desire to build a new liberal state on the twin pillars of home and family became the guiding principle of West German social policy through the 1960s. But what is often forgotten is that design played a decisive role in this Cold War project. The crusade to strengthen the family was complemented by the widespread postwar campaign to modernize the German home as a symbol of denazification and cultural progress. It was precisely this linkage of the family and modern design goods that gave the Cold War construction of West German modernity its distinctive flavor. Once again, American materialism was treated as the chief bugbear. Just as West Germany's design culture had condemned Raymond Loewy and American streamline design as both dishonest and culturally corrosive, these reformers worried about the deleterious cultural effects of Americanized material egoism. What prevailed, however, was not an ideological separation of the family and the market, but rather a new rhetoric devoted to reconciling individual consumerism and family values. Here Erhard himself led the charge. In numerous speeches and writings, he maintained that this very coupling would help counter the perceived pitfalls of American-style cultural liberalism. Others too took up the cause, as the home itself became a new battleground of West German "petit modernizers" convinced of the necessary connections among family, modern goods, and progressive culture. The 1950s thus gave rise to a robust flowering of interior decoration, household advice literature, and lifestyle magazines that strove to modernize postwar private life and commodity culture, much of which mass-produced idealized images of the model West German bourgeois family surrounded by modern design objects and the latest consumer appliances. As will be discussed in chapter 6, this new West German domestic culture was framed by the ideal of family-based materialism, one that was supposed to shield West German modernity from the perils of a Nazi past, an American present, and a potentially communist future. But West German designers and educators parted company from these other petit modernizers in critical respects. For one thing, the leading institutions spearheading the "good form" crusade—namely the Werkbund, the Ulm Institute, and the German Design Council—steered clear of linking design with the family or gender. Their overarching aim was to popularize gender-neutral practical things for modern consumers. There was virtually no mention of the "feminization" of forms or any real discussion about neofunctionalism as an intrinsically "masculine aesthetic." In general the high-design crowd concurred with the words of Karl Pawek, the editor of Magnum magazine, when he wrote: "Since all of us—men and women—have discovered the form of everyday things as the domain of our personal existence, men and women are equally interested in the good form of sewing machines, kitchen appliances, vacuum cleaners, radio receivers, and coffee cups. These are no longer the preserve of womanliness. Everybody in fact is compelled by the impulses of form." In this regard, the universalism that had animated modern German design from the Werkbund on enjoyed renewed expression after the war. Equally significant, the West German world of high design displayed much less antagonism toward its East German counterpart than did other cultural branches. Although the Federal Republic's household advice literature expended a great deal of energy on playing up the design differences between West and East Germany, the actual design schools, journals, and government organs in both countries exhibited surprisingly little hostility toward each other. In part this was due to the early postwar conviction that the Bauhaus legacy was a common modernist heritage. Across the Cold War divide the Bauhaus was hailed early on as a badly needed cultural compass. Former Bauhaus teachers and students readily assumed key posts at West and East German art and design schools, while those Bauhaus designers still in Germany quickly resumed their design work after 1945. Even the short-lived and loosely enforced anti-West propaganda blitz in the wake of the Formalism Debate—see chapter 2—did not alter that. And if East German design enjoyed positive coverage in West German design journals, the reverse was also true. GDR design journals gave high marks to West German design and its explicitly anti-American ethos. Perhaps the best testimony was the career of the former Bauhaus student and star postwar designer Wilhelm Wagenfeld, who was consistently lauded as the paragon of design quality and integrity in both Germanys. His collection of essays on design, Essence and Form (Wesen und Gestalt, published in 1948), served as the uncontested standard work for both design cultures, and Wagenfeld's design objects were routinely featured in exhibitions and catalogs in both republics throughout the '50s and '60s. Even more noteworthy was that Wagenfeld shuttled back and forth between West and East German design firms (e.g., Arzberg Porcelain, WMF, and Jena Glassworks) without problem until the erection of the Berlin Wall in 1961. One would be hard pressed to cite such German-German exchange and good will in any other cultural branch. In light of these aspects of German-German Cold War politics, it may be worth mentioning that this project was initially conceived as a larger comparative study of East and West German industrial design. I had hoped to move beyond the surfeit of Cold War cliches to study the ways in which both Germanys drew on the same 1920s modernist legacy of German functionalism in mapping their respective cultural identities along the axes of industry and culture. From the early 1950s on, both East and West Germany invested their respective design cultures with comparable economic importance and cultural prestige in the mutual rush toward full industrialization. They even produced relatively similar institutional structures and functionalist design products, quite free of either Soviet or American (design) influence. Circumstances, however, impeded this systematic comparison. The primary difficulty was that the Amt für industrielle Formgestaltung, the GDR's own government-created Industrial Design Agency responsible for promoting the cause of modern design, closed its doors after Reunification. Its archive was first reopened in the summer of 1995 as part of the new Institute for Product Design in East Berlin's Kulturbrauerei. But by then, my perspective had changed as closer inspection made plain just how different these design cultures were from one another. While I take up some aspects of East German design and aesthetics in chapters 2 and 6, and briefly elsewhere, these are only preliminary sketches. To attempt a full analysis of these complex, contradictory, and radically incongruous Cold War design cultures would have doubled the size of an already lengthy book. For this history of West German design, I have made use of a wide range of sources and documents. Included among them are the papers of various government, economic, and cultural agencies; design school records; exhibition catalogs; design and cultural journals; design firm archives; state and regional archival holdings; cultural criticism; household advice literature; advertising; and product photography, as well as private collections and personal interviews. Not that this was so straightforward as it may appear. Anyone engaged in this sort of material culture project is forced to confront a paradoxical axiom: those things that are most manufactured disappear the fastest. The speed and scale with which these everyday consumer things are produced has largely discouraged cultural collection and re-collection. Unlike the fields of literature, architecture, and painting, whose cultural products are meticulously saved and neatly catalogued for posterity as precious cultural documents—and are often traded for staggering sums—industrial design has not received the same archival respect. This is apparently what separates "high" from "low" culture, as economic value generally translates into cultural value. More, these everyday consumer objects were rarely designed, produced, or perceived as long-term cultural relics, making their stories challenging to write. The designers (if known) generally left little documentation of stylistic strategies; the business firms (if they still exist) have long since discarded their paper work; and the purchasers (if available) provide little more than hazy consumer reminiscences. The difficulty of ascertaining why consumers consume certain products and not others, to say nothing of how they understand and use them, is not just the problem of marketing departments. It effectively represents a sobering epistemological limit for all historians of material culture. In light of these issues, it seemed to make little sense to arrange the book chronologically. To a great extent this is because of the tremendous dilation of design as a new social and cultural phenomenon in the 1950s. In the Weimar Republic the modern design crusade essentially emanated from a few design schools, firms, journals, and organizations. In the Third Reich design was very much tied to the state and can be tracked through state archives and official cultural organs. By the '50s this design world exploded in all directions, and no longer radiated from such clearly defined centers. It became enmeshed in the feverish spread of West German consumerism and the general desire to redesign everything anew. Thus, in order to keep this history from dissolving into a shapeless treatment of '50s "mass culture," I have chosen to organize the book around certain institutional stories and broad thematic concerns as sturdy pegs on which to hang the larger narrative. Chapter 1 explores the place of industrial design within the Third Reich and the changed role and meaning of everyday design wares after 1933. Three pivotal design organizations—the German Werkbund, Albert Speer's Beauty of Labor Bureau (Amt Schönheit der Arbeit), and the long-neglected Kunst-Dienst—are analyzed as case studies of how "re-enchanting" the everyday commodity assumed such scope and gravity within Nazi culture. Chapter 2 then moves on to the post-1945 career of the famed Werkbund. Its reestablishment in 1947 was significant not only because it represented a certain revival of Weimar Modernism, but also because it was the only West German design institution with a pre-1945 history. Its postwar story thus neatly illustrated the particular problems inherent in renegotiating the damaged legacy of German industrial modernism after 1945. Chapter 3 looks at the Nierentisch design world and the reasons this design captured the decade, as evidenced by its strong presence both in '50s everyday life and in the memories of West Germans a generation later. This '50s "alternative" design throws new light on West German modernism, not least because it stimulated engaged discussion about the very form of a progressive, post-Nazi commodity culture. Chapter 4 goes on to examine the career of the Ulm Institute of Design, which was with great publicity christened as the "New Bauhaus" in 1955. Of particular interest here is the school's effort to "modernize" the Bauhaus's humanist legacy as well as to rethink the social meaning of both aesthetics and the design object in modern industrial society. Chapter 5 chronicles the story of the German Design Council and the perceived Cold War linkages among liberalism, the state, and modern design. How the council helped showcase a new internationally oriented cultural identity is a key dimension of this chapter, but equally relevant are the council's efforts to reconcile culture and commerce through such novel initiatives as copyright reform and increased professionalization. Chapter 6 examines the role of design elsewhere in West German culture, most notably among those petit modernizers interested in wedding modern design with the modern family. The chapter focuses specifically on how domestic space was reimagined during the decade and how this in turn dovetailed with the larger reorganization of "social aesthetics" after 1945. How and why industrial design rested at the heart of this post-Nazi negotiation of political aesthetics and the private good are the central concerns here. Finally, the conclusion examines the demise of this design culture, and finishes by discussing the place '50s design has held in West German cultural memory ever since. In plotting the rise and fall of this postwar design culture, I have attempted to uncover one of the long-forgotten spheres for negotiating a new West German culture of remembering and forgetting. At the intersection of technology and Kultur, pedagogy and consumerism, a horrible past and an unsure present, industrial design played host to pitched cultural battles precisely because the stakes were nothing less than the very shape and significance of West German modernity. The struggle to define a proper "Made in West Germany" design style was ultimately inseparable from the more general desire to create a model post-Nazi "industrial culture." In this sense, '50s West German design went far beyond being rectangular and reliable. The history behind these humble everyday goods was really a complex makeover of German modernism itself. Recounting the story reveals the extent to which the contradictions of West German cultural liberalism were inscribed in the very form of its everyday objects. From the Werkbund to the Bauhaus to Braun, from furniture to automobiles to consumer appliances, twentieth-century industrial design is closely associated with Germany. In this pathbreaking study, Paul Betts brings to light the crucial role that design played in building a progressive West German industrial culture atop the charred remains of the past. The Authority of Everyday Objects details how the postwar period gave rise to a new design culture comprising a sprawling network of diverse interest groups—including the state and industry, architects and designers, consumer groups and museums, as well as publicists and women's organizations—who all identified industrial design as a vital means of economic recovery, social reform, and even moral regeneration. These cultural battles took on heightened importance precisely because the stakes were nothing less than the very shape and significance of West German domestic modernity. Betts tells the rich and far-reaching story of how and why commodity aesthetics became a focal point for fashioning a certain West German cultural identity. This book is situated at the very crossroads of German industry and aesthetics, Cold War politics and international modernism, institutional life and visual culture. Paul Betts is Lecturer in Modern German History at the University of Sussex in Brighton, England. He is the coeditor of Pain and Prosperity: Reconsidering Twentieth-Century German History (2003).